After another trip to the animal ER (we had to take him back after he was released on Monday morning), and surgery on Tuesday, Spike came home on Wednesday night. It ended up that he had a bladder stone, something that is extremely unusual for cats. Luckily, we took him to our vet on Tuesday morning, when we picked him up from the ER, and they did xrays. Clear as day, there was the stone! I actually got to look at it when I picked Spike up last night - it was huge - in comparison to cat size standards - how on earth does something like this happend?! The vet is sending it to be tested today - I guess it can be one of two different things, both of which can hopefully be controlled by a prescription diet. The vet went back and forth about whether or not to send Spike home last night. Spike wasn't using the litterbox as well as the vet would have liked (we think his bladder has been over-stretched)... but we also think that Spike was depressed. We think that Spike thinks that he is a person - his personality and mannerisms are extremely unique. He just wants to be talked to and hugged... and he just wasn't getting that kinda lovin' at the ER and the vet's office. So, it was decided that Spike needed to go home, be loved, and hope for the best. I'm happy to report that Spike was extremely happy to be home! He has been purring like no tomorrow, and has been getting all the lovin' that can given. He's been sleeping a lot because of the surgery, and he's been taking a very long time while in the litterbox. Spike has a follow up appointment on Friday morning, so we will see what the vet has to say. Not a whole lot has been happening on the crafting front - I've been way to stressed out and tired from the events of the last six days. I'm way behind on the Christmas Knit List! 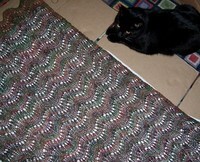 I did, however, complete a Stitch Diva scarf... the ends just need to be weaved in. A picture will be forthcoming! Spike, with Andy while doing work on the computer, purring so loud - I don't think he could have purr'd any louder! Yep - I definitely want to come back as Spike! These are two of our "babies" - the black one is Kodiak (the youngest) and the other one is Diony (the only girl). It is so out of character for Kodiak to be so damn cute, and I just could not help myself. We are missing a snap-shot of Spike (the oldest), he wasn't really doing anything cute, so we will have to save his introduction for another time! I have about 6" left of the sleeve and arm shaping and I will be finished with the right side... then it will be onto the sleeves. Kris, Miyon and I are going to start our washcloth-knit-along on Monday. I was hoping to have Myrtle completed by then, oh well. I'm not that far away though!